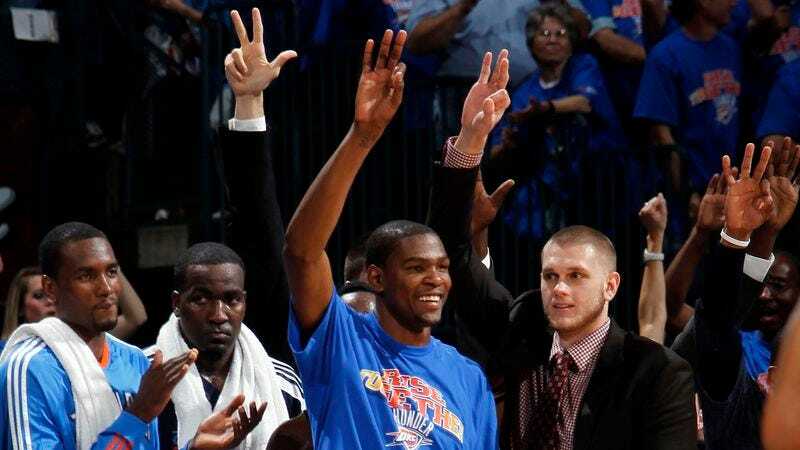 OKLAHOMA CITY—Following their Game 7 victory over the Memphis Grizzlies Sunday, Thunder players spent several hours wandering the streets of Oklahoma City in search of a decent bar or nightclub to celebrate the organization's first Western Conference Finals appearance. "We figured we'd eventually find something, but every place we saw was either closed, pretty empty, or really sad-looking," Thunder guard Russell Westbrook told reporters, adding that Yelp searches on his phone found mostly "nasty cigar lounges and bowling alleys." "You'd think there'd be at least one 24-hour diner or something. You guys just want to go back to the arena and play some more basketball?" After Thunder players spent approximately 45 minutes standing on a street corner asking one another if they were still up for celebrating—and trying to determine if Kevin Durant was serious when he suggested they all drive to Tulsa—the team eventually decided to just go home.